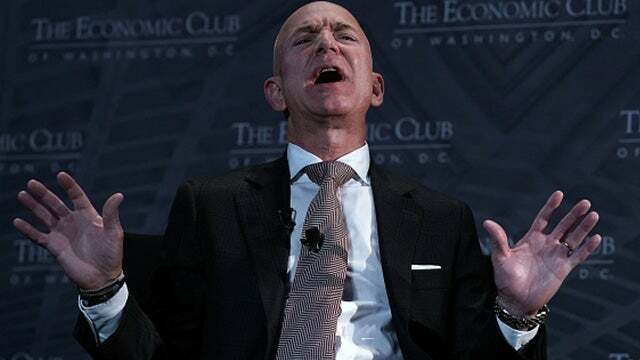 Bezos Sends Genitalia Pics to Mistress – And Trump Gets the Blame! RUSH: Jeff Bezos. Yeah, he's Amazon. But Jeff Bezos owns the Washington Post. Jeff Bezos sent out photos of his genitalia to his mistress, and Donald Trump is being blamed for it. Because the people that have the photos happen to be the National Enquirer. In a bit of irony, the guy that runs The Enquirer is named Pecker. So a guy named Pecker has some pecker shots of Jeff Bezos, and Jeff Bezos claims that he's being blackmailed and extorted. And the media's now saying, "Well, Trump knows Pecker! Pecker knows Trump. Trump has a pecker. So therefore, Trump is behind what's happening to Bezos." Can you imagine if that Little Pinch Sulzberger had been caught doing this? Can you imagine if the great Arthur Sulzberger Sr. and then the Arthur Sulzberger Jr., Little Punch and Little Pinch...? Can you imagine if they had been caught sending out photos of their genitalia to their mistresses? Well, it's happening. And Jeff Bezos owns the Washington Post, and the media's circling the wagons to defend him and somehow try to link Donald Trump to this. But aside from that, what does it say about the leadership of Amazon? What does it say about the leadership of the Washington Post that this is what -- and these people are all leftists. We know that Bill Clinton did -- well, I don't think he ever sent out photos. But what sort of person does this? What sort of man thinks that his genitalia, a photo of his genitalia on a phone of his mistress is going to make her swoon? Do men not realize this doesn't work? Do men not realize that's not what works, if you're trying to make a woman swoon? It's the exact opposite! And yet that behavior is not being condemned. It's being used to condemn Trump somehow. RUSH: Another way of looking at this is you’re the richest man in the world, why in the world do you think your genitalia is what makes people interested in you, particularly women? But it's a crumbling of decency. You know the old saw about we are watching longtime, trusted institutions just fade, be whittled away.